Thanks to its gentle exfoliating power, Coslys Organic Fondant Body Scrub removes impurities and dead skin from the epidermis. The particles of rice and salt powder gently exfoliate the skin and stimulate cell renewal. The organic sweet almond of Provence brings to the scrub nourishing and moisturizing virtues. In contact with water, its gel texture turns into milk and deposits a thin protective film on your body. Your skin is perfectly smooth and soft. She is ready to receive a moisturizer and absorb all its benefits. 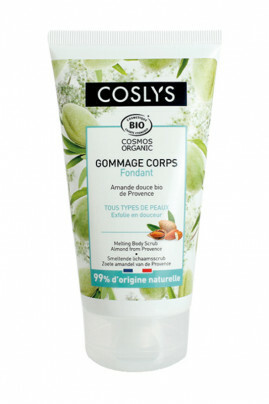 The Coslys Organic Fondant Body Scrub is suitable for all skin types! Coslys Organic Body Scrub eliminates dead skin! In the shower, apply scrub on the body and gently massage in circular movements. At the end of the shower, moisturize your body with a moisturizing treatment like the organic nourishing body milk Coslys. We advise you to make a scrub 1 to 2 times a week. If you apply it on dry skin, its exfoliating power will be increased tenfold. A gentle scrub for the body with organic and natural ingredients! Helianthus annuus (sunflower) seed oil*, glycerin, sodium chloride, caprylic/capric triglyceride, oryza sativa (rice) powder*, aqua (water), sucrose stearate, corylus avellana (hazel) seed oil*, arnica montana flower extract*, prunus amygdalus dulcis (sweet almond) fruit extract*, glycine soja (soybean) oil, polyglyceryl-4 caprate, parfum (fragrance), tocopherol, levulinic acid, sodium levulinate, sodium benzoate, sodium dehydroacetate, linalool.